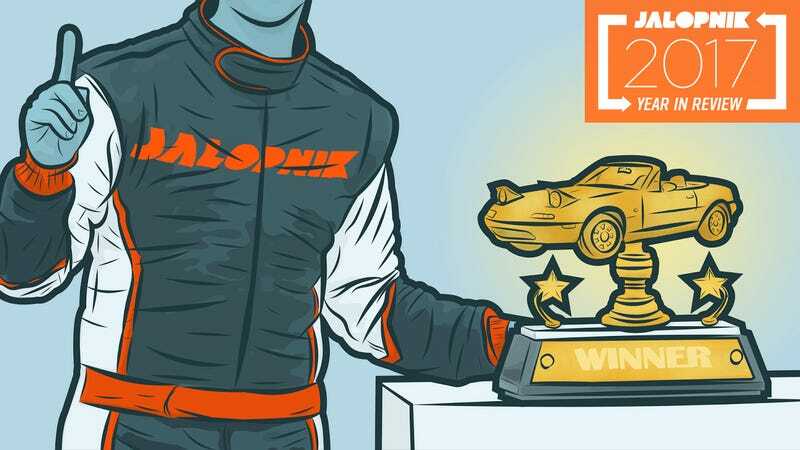 I had a hard time choosing my favorite stories Jalopnik published in 2017. That’s because between prison snitches, BMW addicts, doomed startups, car hoarders, secret Porsches and hurricanes, there was almost too much good to choose from. Around these parts, 2016 was all about survival. At the outset I figured 2017 would be a rebuilding year. Instead, it ended up as the most successful year in Jalopnik’s entire history. And we did all of that on the back of some excellent stories, many of which you will read below in my annual editor’s picks roundup. These represent, in my humble opinion, the best of what we do: the best features, exclusives, investigations, hot takes and shitposts that make Jalopnik stand out against the endlessly bland and indistiguishable landscape of automotive journalism. We don’t plan on slowing down in 2018, and we don’t plan on changing much. We want to do more video. Car vs. America looks like it’s coming back for another go. On the site we’ll be broadening our coverage of car culture and technology, and away from it we’ll be doing more big events with you fine people. And as we address the topic of how autonomous cars are the future—or not!—we’ll figure out what that means for people who love to drive. I’m excited, and I hope you are too. Onward and upward. I believe this ended up also being the most-read Jalopnik story of 2017. Houston enthusiast Cody W. Crochet didn’t let Hurricane Harvey push him around, and for that we salute him. Our tame racing driver Robb Holland actually went out and did the kind of thing car people come up with after having too many rounds of drinks: he bought a salvage title C7 Corvette Z06, built it into a race car and set it loose on Pikes Peak. Then he set a record on the famed course. You should read this series if you haven’t already. The hell that Flint, Michigan went through with its water crisis is more complex than people think. Here, Ryan expertly documents how conditions that led to this disaster built up over decades through suburbanization, white flight, a crumbling tax base, poor infrastructure and terrible development decisions to keep General Motors happy. The last line in the piece still haunts me personally when I think of Flint. When David went to Hong Kong, he spent time with one of the most interesting people in the entire car world. Get to know Victor Ma, perhaps China’s top authority on 4x4 vehicles, and meet his insane collection. Writer and essayist David Obuchowski had some strong stories here this year, starting with this one. What happened to Terrance here—what Terrance did—isn’t really about cars. It’s about something much darker and sadder, and I think that’s why it resonated with so many people. Peter Monshizadeh is an angel from heaven who drops into my inbox without warning and gives me an amazing new story about successful vehicle repair. Many of us dream about owning one of the flagship 1990s Japanese sports cars, but his Nissan 300ZX rebuild series offers more than dreams. It’s a collection of longform, in-depth diaries on how to live with and fix these cars successfully. Expect more from him in 2018. When Ryan came to Jalopnik after covering politics and justice in the Midwest for The Guardian, he told me about an investigation he spent more than a year working on and asked me if Deadspin or Fusion (now Splinter) might want it. I said no, because even though it was outside of Jalopnik’s purview, I believed in it enough that I wanted it here. It’s something very different from us but well worth the read. I feel like in a lot of ways, 2017 was the year of reckoning for many automotive and transportation startups after years of endless hype and easy VC money. We will see if Elio Motors makes it past 2018, but what happens to the Louisiana town where the new jobs were promised? Our Canadian friend William Clavey had a lot of great reviews and stories this year, but this one was my favorite and the most Jalopnik: unbridled, almost unreasonable enthusiasm for an obscure and somewhat unloved car. Kristen’s profiles of women working in the car industry are extremely worth reading, but the first is my favorite, because Darby is rad and she’s working everyone’s dream job at a super young age. The car industry needs more young enthusiasts like her making things happen. Alanis had a great first year as a full-time Jalopnik writer, and I loved this story because it shows the hidden, ugly underside to the economics of cars. The mechanics and dealers finally came to terms after seven weeks of striking. Another jam from Obuchowski that’s not really about cars, but about loss and how neighborhoods leave people behind when they change and gentrify. Radar’s still after his dream Charger, in case you’re curious. I hope he gets it someday. David is the hero that old Jeeps deserve. I mean, it didn’t end great, but he tried! “People who get it know there’s something satisfying about driving a car with pedigree, and the imminence of disaster is just part of the adventure.” I can’t think of a better way to summarize old car ownership than what Andrew wrote here. Every year David takes on a new car project and gets it in shape to run in the Easter Jeep Safari in Moab, Utah. This year was his most ambitious attempt yet in a decrepit WWII-era Jeep, but it ended up doing pretty well out there. It just wasn’t very cheap. It is incredible to me that the entire car industry is chasing after a money black hole that also happens to be horrible to women and drivers and often to its own customers. But hey, mobility! A Car Nerd’s Guide To Japan was one of my favorite features of 2017, but this fish out of water look at an underground car meet in the U.S. stood out the most to me. We should bring Ken to H2Oi next year. If it happens. Speaking of, Kristen brought us a look at how car cultures change over time and even get subverted by newcomers. What does H2Oi mean anymore, and who gets to decide that? At least we got what was probably the best Car vs. America episode out of the event. It took me a while to figure out how we, a car enthusiast site, should approach the subject of autonomous cars. But the more we reported on the topic, the more we figured out that maybe buyers don’t want it, maybe it will screw over poor people, maybe the tech isn’t really ready for primetime yet, and maybe the thinkfluencers from Silicon Valley don’t really know what’s best for us. A lot more skepticism is warranted here than what you get in the mainstream tech press, and that’s how we plan on facing this topic in 2018 and beyond. Human driving still matters, and it will for a long time. It’s hard to pick the best Jason Torchinsky stories because everything he does is crazy and magical, but this may be his magnum opus. Prove us wrong, Pixar! David and I respectfully disagree with one another over whether Ron Dauzet is a collector or a hoarder, but we both agree he’s been put in an impossible situation here. Stef had great interviews with the designers of the Nissan 240Z and Z32 300ZX this year, and they are united by one common thread: that anytime something cool happens at this conservative Japanese company, it’s because some young maverick pulled a fast one on management. I’d say Nissan could use more folks like that right now. A bizarre tale of madness, obsession and money that could only come from the Germans, expertly told by Raphael Orlove. The Associates were his wife and kids! Everything in life is a lie. Not a ton of people work in both the auto industry and auto journalism, but David has done both, and for him that meant keeping quiet about the 2018 Jeep Wrangler when the rest of us goons scrambled to find out everything we could about it. Here’s a fun story about being on both sides of the fence. Was 2017 the year the world’s collective honeymoon with Tesla came to an end? Maybe so. The automaker desperately needs to deliver on its ambitious promises with the Model 3, and soon, and new roadsters and semis and rockets aren’t going to fix the problem. Ever wonder what happens at one of these things? Now you know. And yes, I do worry about David. A lot. It’s not often that a car review rises to something more, but Kristen’s take on the most iconic Mercedes-Benz ever and its current flagship convertible reveals a lot of greater truths. Also, the photos are gorgeous, and you’ll be jealous that she got seat time in both. Faraday Future has been weird and insane and incomprehensible since the beginning, and it may just be sticking around for at least some of 2018 now. Here, Ryan gives the best look anyone has ever done at the man behind it all. We can’t wait to see what happens next with the world’s most fascinating would-be carmaker. Alanis is passionate about finding and preserving America’s fading small town race track history. Here’s the tale of how one such track in the shadow of Circuit of the Americas came to a sad end. Bill Caswell is a friend and a Jalopnik legend, but what’s it really like to live the Build Race Party life? You think you might be up for it, but you probably aren’t. Andrew’s profile details how the man himself does it—or, sometimes, doesn’t. He’s human after all, even though he’ll be mad at me for revealing that secret to you. In Japan, Ken drives one of my favorite forbidden fruit JDM cars of the moment and delivers gorgeous photos as well. When 2042 rolls around, I’m putting one of these in my garage. If I’m not dead. Which, more than likely, we all will be. As we all look forward to 2018, I’ll leave you with some thing to be not-optimistic about. 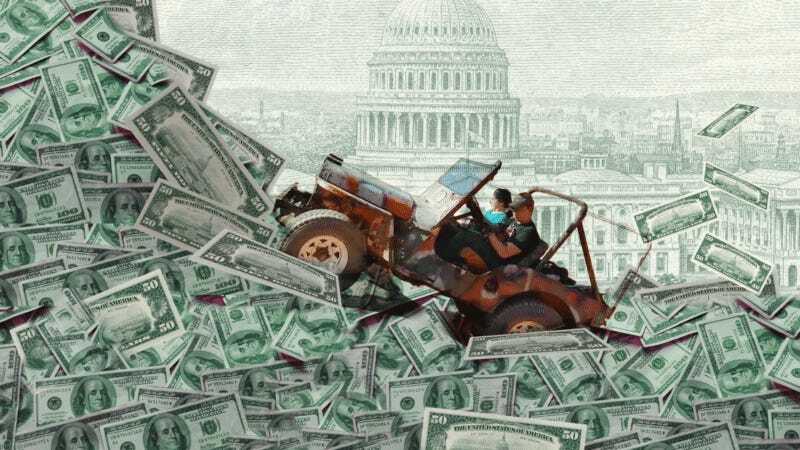 Skyrocketing loan terms, booming crossover and SUV sales, rising new car prices, more defaults than we’ve seen in years, stagnant incomes and the lowest savings rate since the recession: the ingredients are all here for the auto industry to face another crisis soon. And it’s going to take a lot of people’s personal finances down with it. Okay, fine. We’ll end on a positive note. Down in Christiansburg, VA, a man named Gary Duncan has the greatest car collection you’ve never heard of—rooms and rooms full of Nissan Figaros and Toyota Seras and Japanese funeral cars, just to name a few. At the office, as we watched the tour on Facebook Live, we all thought we had dropped acid by accident. But this place is real, and it is fantastic, a testament to one man’s wonderful obsessions and willingness to share it with the outside world.